Main street in downtown Weslaco. After U-turns on the edges of grapefruit groves, repeated pullovers to study our Rio Grande Valley street guide, and a precarious three-point turn on the narrow levee road where a border patrol truck blocks our path, we are really lost. 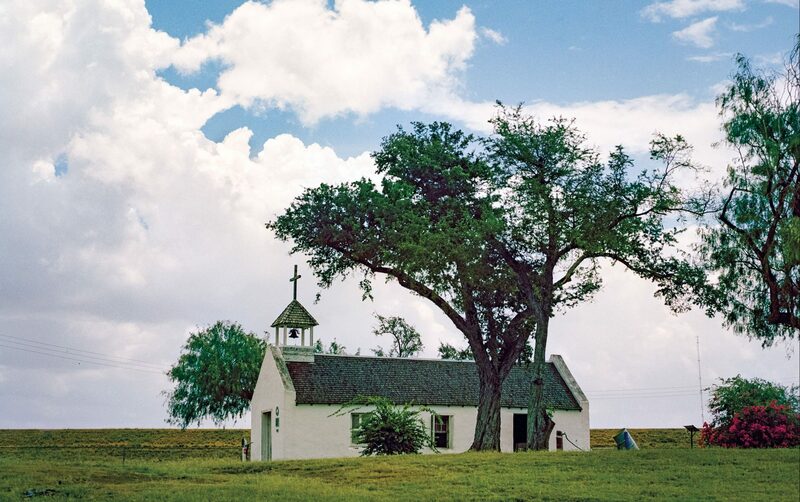 Like so many wanderers before us, we are searching for La Lomita Mission, which a local history buff named Frank told me about at an Edinburg bar the night before. “Just travel the Old Military Highway that goes along the Rio Grande,” Frank said. What Frank didn’t say was that Military Highway, much like the river it runs along, is a trickster that stops, starts, and twists in unexpected ways. But “unexpected ways” is what this four-day road trip through the Valley is all about. I’ve powered off my iPhone, forgoing the comforts of GPS for that old-school wonder, the paper map. A tech-free road trip feels radical when most of the cartographic knowledge you’ve had for about the last eight years has been contained on a 3-by-5-inch phone screen. What would it be like to get to know the Rio Grande Valley—a place I’d never been—the old-fashioned way: by talking with real people and unfolding a map? Social media, web searches, and GPS can only take you so far—the best part of the story is often the one you get from that guy who happens to be sitting next to you at the bar. Which, I admit, is why we are lost. Frank, the friendly history lover I met at Edinburg’s Cubby Hole bar, gave vague directions, and now my fingers are itching to dig out my cast-off phone from the bottom of my purse. Frank had told me about Father Pierre Kéralum, the most esteemed of the roaming French Oblate missionaries of the mid-1800s who traveled on horseback to communities along the Rio Grande to baptize, wed, and preach. In 1872, however, Kéralum set off on the cattle trails to minister to the many Catholic ranch hands who worked this wild land. He vanished, and his dry bones were found 10 years later, still clutching his religious relics. Sometimes getting lost is perilous business. A tech-free road trip feels radical when most of the cartographic knowledge you’ve had for the last eight years has been contained on a 3-by-5-inch phone screen. We found it! But as we pull into this unassuming park, doubt creeps in. 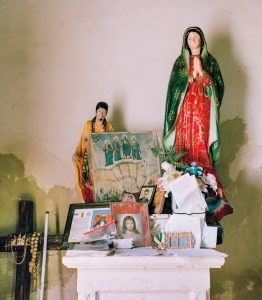 I don’t see a mission like the grand ones I’ve visited in San Antonio and Goliad but rather a one-room white adobe chapel. When I step out of the car to investigate, I’m hit with a smell so sweet and familiar I get a rush. Summer rain. Fresh, reviving, summer rain. The clouds Kenny had been reading to steer us here have opened and are bathing the Valley in raindrops. We run for cover up a small hill, or lomita, and into the open door of the chapel. Dozens of lit candles, animated and flickering from the breeze of the rain shower, welcome us. 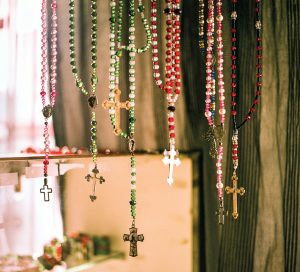 We’ve found it—a sacred space tucked away in El Valle—pilgrim’s gold. 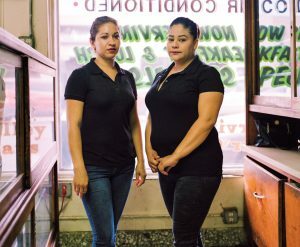 Waitresses at Rex Cafe & Bakery. We are the only ones here. Yet, because of the spiral notebooks stacked on a side altar overflowing with people’s prayers and wishes, I don’t feel alone. While the rain softly thrums on the chapel roof, I pore through the many handwritten messages—a girl tells her grandmother how she misses her, a man asks for peace for our country, and a mother prays for health and happiness for her children—all notes that I could have written, too. Once the rain stops, I examine the historical markers outside. They explain that the original adobe chapel dates to 1865, and this little park, where devotees still gather yearly to honor Father Kéralum, was built for the 1976 U.S. bicentennial to preserve the area’s history “for future generations,” it says, “lest we forget our humble beginnings.” Remembering our humble beginnings—now that’s something worth musing upon in a chapel on a hill in the middle of the Rio Grande Valley. I also very much want to muse upon tacos. A fellow writer and McAllen resident, Daniel Blue Tyx, had told me about Rex Café & Bakery, a classic eatery that opened in 1947 and won’t pop up on TripAdvisor. “Go early on a weekend morning,” he said. “It’s hopping.” What an understatement. 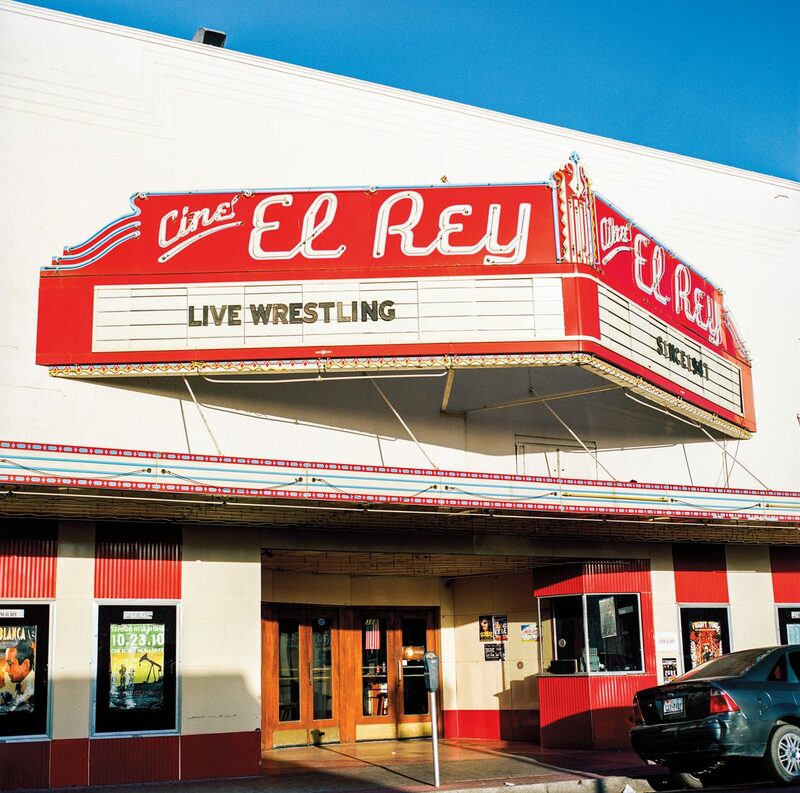 Daniel did not mention that Victor Chapa, an organist, would be there cranking out rancheras and corridos at 7:30 a.m., or that this landmark of Latino culture would be so packed that we’d be lucky to find a seat at the counter. But we do, and it is there at the counter over chorizo and egg tacos that I meet Anselmo, a man in his 80s with a thin black mustache who asks me if I am a truck driver. “No, I’m a travel writer,” I say. “A missionary?” Anselmo asks. It must be hard to hear over the buzz of conversation and organ music. “No, I’m a writer from Austin,” I say. 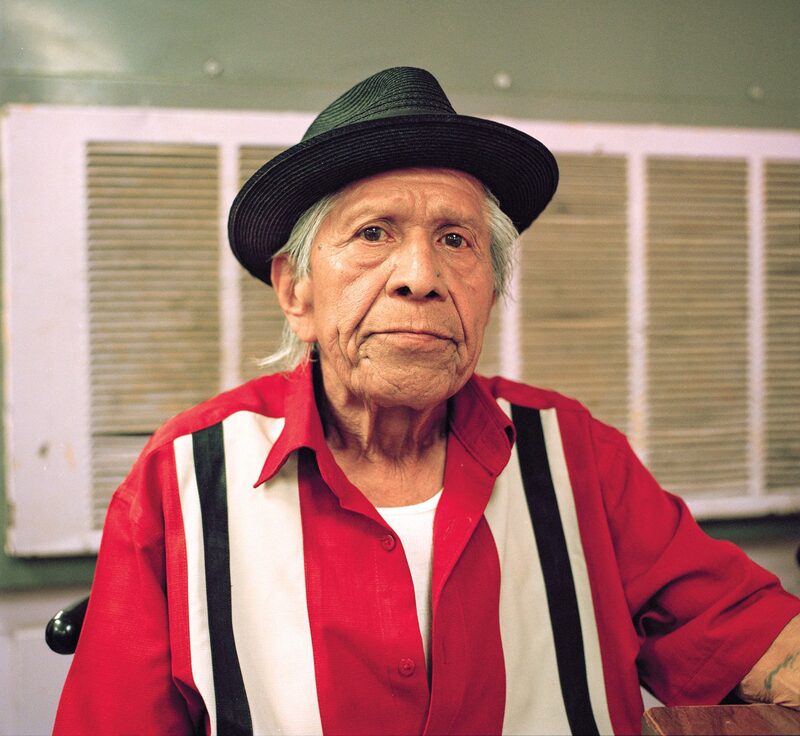 “Oh, I love Austin—that’s where I turned my life around,” he replies. I’m giddy from so much kinship—and good coffee—and it’s not even 10 a.m. yet. And though the genuine bonhomie here makes me want to linger, Kenny and I say our farewells. We want to make the big pulga, or flea market, in Alamo before it gets too crowded. As we head for the door, Anselmo stops me to say, “You know, I want to tell you, my wife died two years ago. We were together 53 years. I still miss her very much.” My heart cracks a little. The grieving, the hopeful, the friendly guys in fedoras—they all come for breakfast and camaraderie at Rex. No surprise, it’s far more satisfying than checking my Facebook page. Thanks to the folks we’ve met so far along the way, we’ve found our groove, which soon takes us to the Echo Hotel and Conference Center in Edinburg, a formerly grand ’50s-era time capsule that gives you coupons for their $1 breakfast and a free drink at the bar. In hopes of using the latter one night, we follow the thumping merengue beats to the bar, appropriately named the Tropicana Lounge. Birders flock to the center of the RGV for guided field trips, educational seminars, and social events. The biggest celebration in the Valley brings together the sister-cities of Brownsville and Matamoros, Mexico, to celebrate the border’s distinct bicultural heritage. 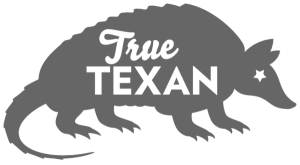 The annual folklife festival celebrates the city’s blended international culture with live music, dance performances, diverse cuisine, and cultural activities. As soon as we pay our $5 cover we are immersed in a fascinating Friday night world unfamiliar to me, where mustachioed men in black cowboy hats move ladies in short, sequined dresses across the floor, and the Tejano accordion players make their own kind of magic out of polka riffs. As we sit at the bar marveling at the music and dancers and talking to a Minnesota truck driver in town to pick up a load of Mexican watermelons, I have the sensation that, even though I am still in the state where I’ve lived my whole life, I am visiting a very different, very friendly country—one I really like. But our tech-free days in the Rio Grande Valley aren’t always such an easy flow of human connection. I face moments of traveler’s weltschmerz—the German compound word for “world weariness.” Every so often we walk empty streets seeking a sign of life—or a fresh lime margarita—and find nothing. Hints of weltschmerz kick in when driving up and down highways 83 and 281, long stretches of strip malls and big box stores. Kenny reminds me that the groundbreaking 1970s photographer William Eggleston once said that you could take a good picture of anything. I wonder if even Eggleston would find inspiration at the chain restaurants on the 83 feeder road. Call it slow travel. Call it digital detox. People pay to go to “black hole” resorts where they must turn in their cell phones. He’s right. 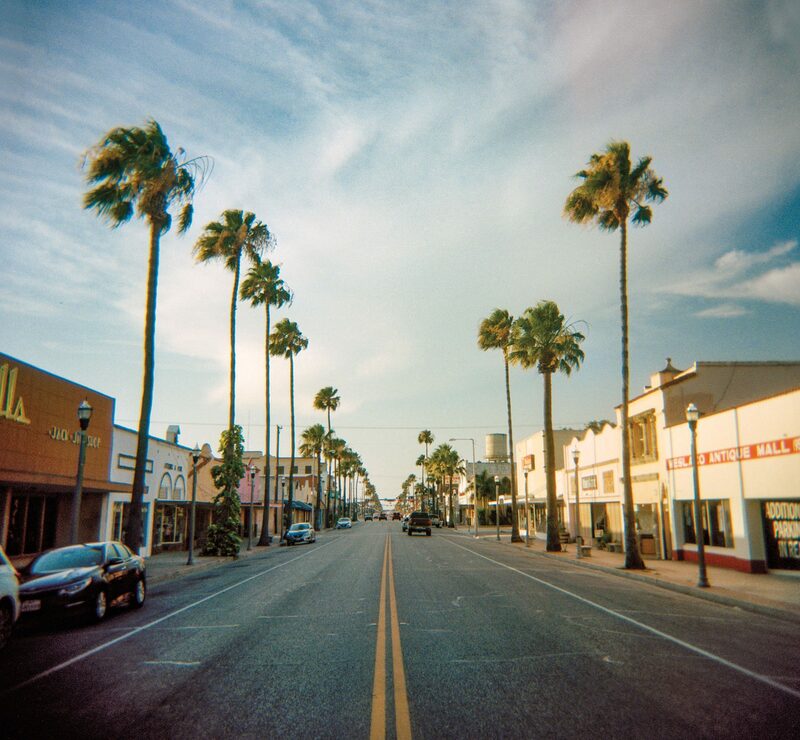 A walk down the palm-lined but empty main street of Weslaco finds us soon in the midst of a hopping art opening at the Weslaco Museum, where I meet Gabriel Salazar, a petite, smiling artist who is known for his sweeping landscape paintings of the lush Rio Grande Valley. Cheerful ladies hand us punch and remind me to wear more sunscreen. And, happily, the very smart museum director, Sara Walker, a Boston native, tells us where to find the best fresh lime margarita in the area—Arturo’s, a restaurant off the expressway in Weslaco we would visit more than once. In all of these adventures, Kenny and I are pretty much the lone visitors from northern lands. As far as I can tell, there are no other tourists dancing at the Tropicana, eating tacos at Rex, or getting their cards read by Pablo. There is however, one very big exception: the thousands of people from across the globe who fly in each year, binoculars in tow. Birders. “This is the best birding in the country,” says Mary Beth Stowe, Alamo Inn’s veteran birding guide, a former Californian who moved here for the birds and affordable lifestyle. Mary Beth is showing us our suites at the inn, a bird-centric lodging that invites you into an unfamiliar world where people rise before dawn, carry spotting scopes, and tuck their pant legs into their socks to avoid bug bites. The inn is owned by Keith Hackland, a naturalist, birder, and native of South Africa who did a year abroad here as a high school student in the 1960s. Thirty years later and single, without the aid of social media, Keith tracked down his former high school sweetheart, a third-generation Valley resident named Audrey. Now married, Keith and Audrey are key players in the birding and community life of the “Republic of the Rio Grande;” they also have a very outspoken pet goose named Guardian who protects the inn—and thankfully doesn’t honk at night. Before dawn one morning, Mary Beth takes Kenny and me on a birding tour of the nearby Santa Ana National Wildlife Refuge. Looking through her scope at a yellow-crowned night heron, I see his orange eyes and the long white plumes of his crown with such sharp clarity it’s as if I were sitting on the branch next to him. Mary Beth, who birds by ear more than sight, recites the names as she hears them: Altamira orioles, great kiskadees, green jay. By the end of our outing, we’ve spotted 60 different species—amazing to me but a meager showing, Mary Beth reports, compared to other times of year. As we head for the woods in search of chachalacas, the goofy chicken-like cackler ubiquitous in the RGV, Mary Beth receives a rare-bird alert from her birding app. An elusive Mexican violetear hummingbird has just been spotted at the Quinta Mazatlan nature center in McAllen. Mary Beth, in her 51 years of birding, has never seen a Mexican violetear—this is a “life bird” for her. We take off in hot pursuit. 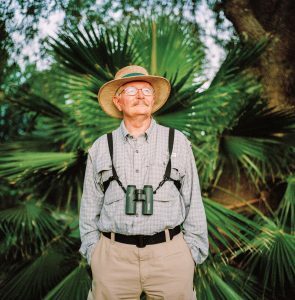 When we arrive at the bougainvillea-draped grounds of Quinta Mazatlan—a former private estate turned nature preserve—a few birders are clustered around a patch of trees. The violetear—a 4.5-inch sparkly green and blue-hued marvel—has vanished, and they are awaiting its return. Mary Beth and I also sit down and wait. Suddenly, the little critter buzzes up, and the group of waiting birders erupts into a flurry of gasps, gestures, and pointed cameras. Sharing telescopes and binoculars, we all get a solid look at the violetear; we high-five each other, some hug; a few tears are shed. To witness a group of people so genuinely happy about this small creature is an antidote to all of the weltschmerz of the world, at least for that moment. 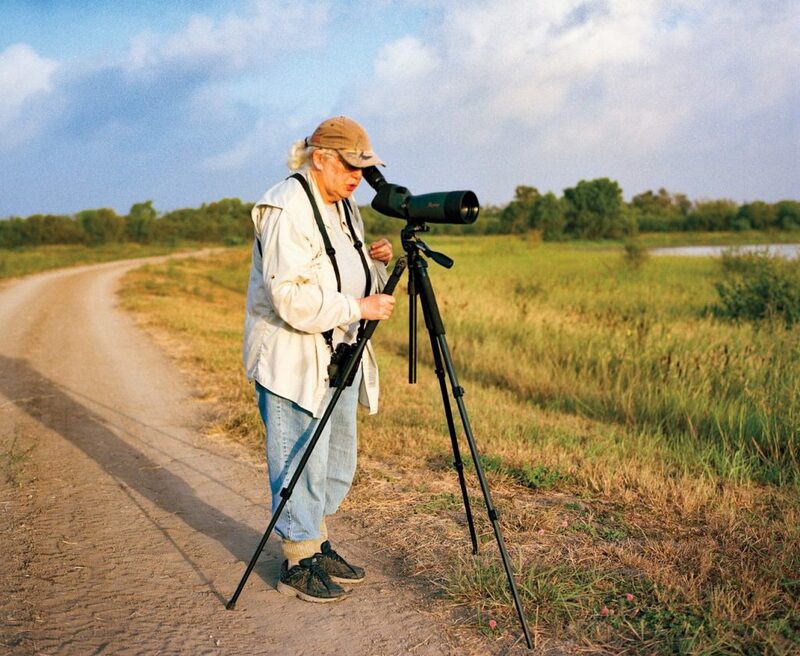 Mary Beth Stowe, Alamo Inn birding guide at the Santa Ana National Wildlife Refuge. Sometimes you have to sit and wait and see what happens. Other times you might need to respond to a rare-bird alert. These birders have it right—the apps and devices can enhance the experience, but not if they dominate it. Because if you’re too absorbed in your gadgets, you’ll definitely miss the Mexican violetear—which, I must say, is a high I’ll never forget, especially the way it scratched its purple ear floof with its foot. Who knew a hummingbird could scratch its own ear? 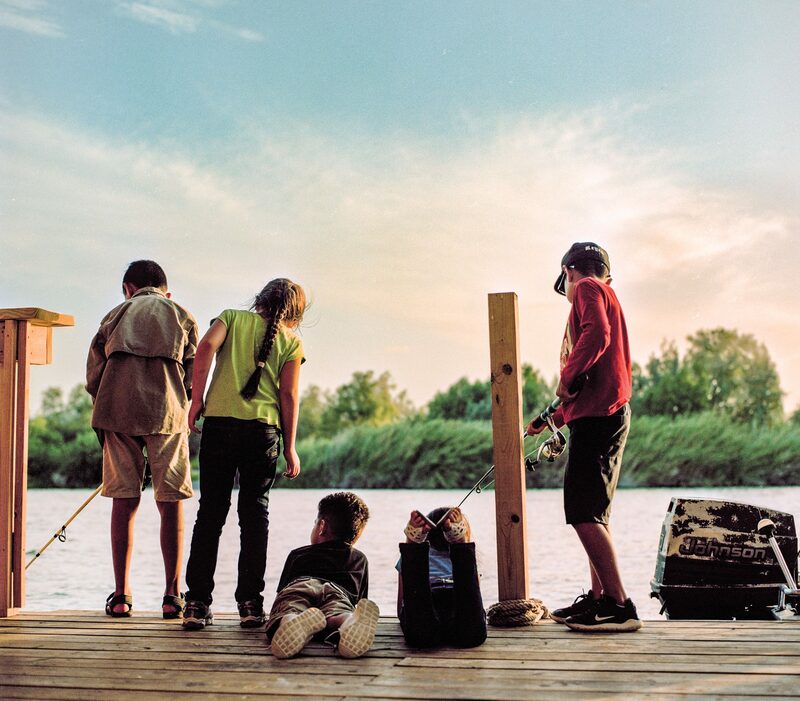 Kids fishing on a dock at the Riverside Club in Mission on the Rio Grande. Call it slow travel. Call it digital detox. People pay to go to “black hole” resorts where they must turn in their cell phones. Kenny and I just drove down to the Valley, got unplugged, and got lost, connecting with some real characters along the way and with each other. The go-with-the-flow road map approach is much better when good company’s along for the ride. As the birders’ high-fives at Quinta Mazatlan attest, the thrill is diminished if it’s yours alone. To find a tiny candle-lit church in the middle of nowhere during a summer rain shower is cool, but it’s far cooler if a friend helped you find it. I’ll admit, I was happy to turn my phone back on for the drive home. But, unlike just a few days prior, I didn’t feel like I needed it anymore.